Demon Bhasmasura performed intense ‘tapas’ (penance) for several years with only the thought of Shiva. Asur Bhasmasura kept on chanting nothing but Siva, Siva... Finally, Shiva relented and granted the demon the boon that he asked – that he could burn to ashes anyone whose head he placed his hand. There are numerous versions of the story. Below are some of the popular versions. An Asura, Bhasmasura showed his true color and he wanted to test the power of the boon by placing his hand on Shiva’s head. Shiva fled in terror and sought the help of Vishnu. Now, Bhasmasura had the evil desire to seduce Goddess Parvati. This was one reason why he was chasing Shiva. Vishnu who knew about this evil desire took the form of Goddess Parvati. This form of Lord Vishnu is known Lakshmanjati. Vishnu in the form of Lakshmanjati was able to garner the attention of Bhasmasura. Soon, Bhasmasura forgot about touching Shiva’s head and followed Vishnu, who was in the guise of Goddess Parvati. Enamored by Goddess Parvati, Bhasmasura lost his mind and became a puppet in the hands of Lakshmanjati. She made Bhasmasura dance by saying that she likes the dance of Shiva. 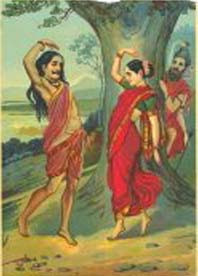 While dancing she asked Bhasmasura to place his hand on his head and which he did immediately and was reduced to ashes. This story is found in the Skanda Purana. There is another version of the Bhasmasura story which suggests that Vishnu took once again the form of Mohini. Vishnu had first appeared in the form of Mohini to trick the demons, and take away Amrut (Ambrosia) during the churning of ocean. A womanizer, Bhasmasura fell for Mohini’s beauty and she tricked him to placing his hands on his head. In yet another version, Vishnu appears as himself while Bhasmasura was chasing Shiva and asks what is happening. Bhasmasura was never a true devotee of Shiva. He performed penance and prayed to Shiva with selfish motives - he was only interested in gaining boons, material comforts and controlling the world. The words of Vishnu created doubts in the mind of Bhasmasura and finally he placed his hand on his head and he was reduced to ashes.